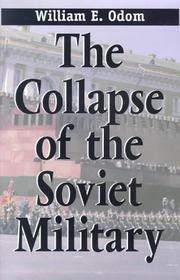 A subtle, profound, and authoritative assessment of the life and sudden death of the Soviet military by the former director of the National Security Agency. By almost every measure, the Soviet armed forces were the largest in the world. By 1985, they were nearly 6 million strong, with another 25 million reserves. Behind that force stood a military-industrial complex far larger than the West understood, accounting for at least 20 percent and perhaps more than 30 percent of GNP. It was plain to Mikhail Gorbachev and even to military leaders that, if the Soviet Union was to deal with its economic crisis, it had to bring these expenditures under control. The genius of this analysis is to show how a —cold, calculating, and brilliantly duplicitous— Gorbachev outmaneuvered not only his opponents in the Politburo and the military but even himself. His weakness in economics has been widely commented on, but Odom shows that his large, unilateral reductions in the size of Soviet forces, intended to show the West that the Soviet Union was serious about negotiating mutual reductions, began the process of disintegration. Glasnost also turned a harsh light on the realities of military life. Odom argues that there was a serious moral deterioration in the military in the1970s and ’80s, that hazing became increasingly dangerous and uncontrolled, and that resistance to conscription developed rapidly. Many in the military saw the danger and opposed his policies, but the close relationship between the party and the armed forces made independent action difficult. The military leadership was also —too corrupt, weak, careerist, and indecisive to act on its own.— The final irony was when a group of generals around Yeltsin, for corrupt reasons of their own, schemed to prevent the Soviet military resuscitation in the short-lived Commonwealth of Independent States’ armed forces. A careful, thoughtful, and outstanding contribution to the understanding of a tumultous period.